For this product review, the DIY Doctor takes a look at the colour match and weather tint for bricks, brickwork and mortar available from Bebbington Brick. Quite often, building work involves replacing old bricks or mortar with new and this replacement always tends to stand out from its old, weathered and faded surroundings. The brick tint from Bebbingtons allows you to match the new brickwork and mortar to the old making the repair work much less obvious. The simple to use dye involves applying a new coat each time you want to darken an area and adding water to lighten making it very easy to use and blend with existing colour tones. 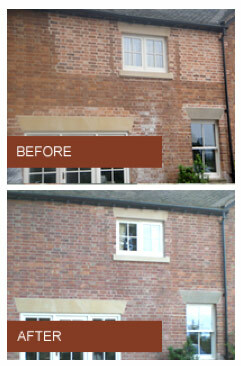 What Does Brick and Weathering Tint do? This review of the Bebbington Weathering tint shows that it is possible not only to match new bricks and other masonry products to those around it but that by using Bebbingtons, the new work will weather in at exactly the same rate as the old. Toning down new brickwork has been an age-old problem in the construction industry. Today’s enlightened home-owners are saving thousands of pounds by improving, not moving. With extensions, conversions, refurbishments and alterations come new roofs, new walls, new patios, new stonework and many other projects involving masonry. In most cases, the new work sticks out like a sore thumb but with an application of Bebbingtons as shown in the review video above, these "striking" changes can be a thing of the past. The review shows that Bebbingtons is excellent for all properties as the Weathering Tint does not clog the masonry or the joints and does not form a surface film. This keeps the masonry breathing all the time, allowing moisture to evaporate. The colour stays "fast" and the quality and integrity of the original work is not compromised. A Very old building with a huge barn conversion going on and literally tonnes of stone being replaced. Add that to some builders who did not consider matching the mortar colour when they added new stone and we have a property which looks a little like a patchwork quilt. As well as the old stone building you can see in the video, we took Bebbingtons to a recently altered stables where the new blockwork stood out so much it nearly shone!! Then we tried it on an old replacement clay Pan-Tile close to Nunney Castle in Somerset. The answers to all our questions are obvious in the video but this on site test really did put Bebbingtons Weathering Tint through its paces and it came out a clear winner. On the stonework and the tile you can see in the video, we had to darken the original application of tint. This is done simply by over coating as many times as is necessary. The tint gets darker the more coats that are applied but do follow the instructions below to make sure you allow a suitable time in between coats. On the blockwork in the video, the opposite was required, we needed a lighter shade of Bebbington’s. This too was easy; we just watered it down to reach teh desired colour shade! When applying the tint, try it out on a hidden or out-of-the-way corner to make sure you have the right shade. Remember the tint will dry out lighter than it’s original application colour so give yourself plenty of time. However excellent this product is (and you can see our opinion of it below) It is not a "Harry Potter magic trick" and as with everything that is long-lasting, the better the preparation, the better the job. A couple of hours spent making absolutely sure you have the right colour match will be a job that lasts you a life time. We had to put this section in the review because the answer is: No-One knows!! Apart from the Bebbington family that is. Bebbingtons’ "recipe" for this amazing weathering tint is a very closely guarded secret and has stayed in the family since the inception of the company in 1968. Quite rightly, Bebbingtons are very proud of their heritage and they are now in their 3rd generation of it being kept in the family. As with any business of this nature, this longevity leads to pride in both the company and the product and this pride shows through in the companies approach to both their product and the customer service that surrounds it. Where else can you get a 40-year guarantee!!? We have included the Bebbington published instructions for using the weathering tint at the end of this review just to show you how simple it s to use. Simply shake the bottle (and shake regularly to ensure that all weathering tint is mixed all the time to keep the colour uniform. Remarkable!! It’s as simple as that. If there was a 6-star award, we would give it 7. Bebbington’s solves a problem that has plagued builders for donkey’s years. It is the single largest cause of complaint when home-owners take delivery of a brand new extension that stands out so much from the original building it sometimes looks hideous. Similarly, having a boiler flue sticking out of bright orange bricks when the rest of the wall is beige makes a good job look horrible. 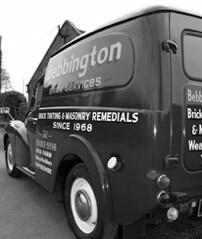 We have some, we speak about it all the time, we use it regularly and we are very pleased to be associated with the current owner, Mark Bebbington who’s attention to detail has taken Bebbington to a new level of customer service which, on top of an excellent product, makes them stand out among equals. One of the many great features about the tint is that it will not seal the surface that it is applied to meaning that it can still breath naturally. It will also weather at the same rate as any untreated surfaces. Before you start, make sure that the tint is thoroughly mixed before you start applying it. To do so you will need to shake the bottle thourghly for at least 15-20 seconds and once you have done this, pour the contents into a suitable container. Also, please make sure that there is none of the pigment remaining in the bottle. Once the above steps have been completed you can then start to apply the tint. When applying, ensure that you stir the tint after every other brush application to make sure that the tint remains at teh same tone. As with most painting jobs, to avoid any drips and spillage, load up the brush with tint and then remove any excess. To confirm the colour match it is always a good idea to test on a small and discreet area first. To get a good idea of the final colour you will need to leave the tint to cure for a full 12 hours. In respect to the surface you are covering, it will need to be completely dry. Any tinting should not be done in temperatures below 5°c. If you require a lighter finishing tone, this can be achieved easily through diluting the tint with water. This can be done up to 50%, but if you go over this you risk weakening the mix to such an extreme that it may not correctly bond with the surface it is being applied to. To create a darker tone, simply apply additional applications of the tint until you reach the desired colour. You will need to leave around 30 minutes between coats. To ensure a nice tidy finish, cover all areas below and around you that you do not want the tint applied to. Remember, this is effectively a stain. If you do get some on an unrequired area, clean it straight away with clean water and mild detergent. Before using Bebbington’s tint, please read the container label in full, paying particular attention to the safety panel and follow any guidelines that it suggests. If you would like any further advice on the use of any products, please use the following contact details.